Born in the Maasai village of Loodariak, Kenya, Teriano Lesancha was the eldest of 15 children. 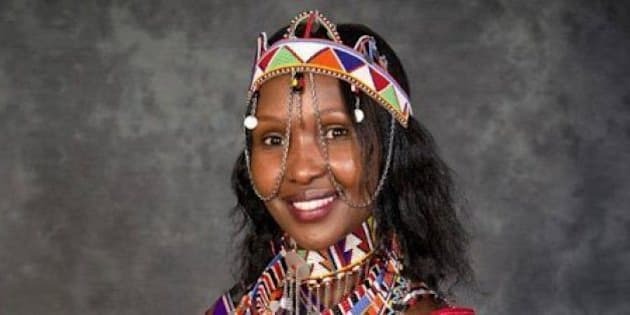 At birth she was promised in marriage to the 27-year-old son of the midwife who delivered her; Teriano was supposed to marry him when she turned 12, as was the Maasai custom. Most Maasai women do not have access to education -- in fact, 99 per cent of women and girls in Loodariak are illiterate. But Teriano's mother wanted a different life for her daughter. Ryerson graduate, community organizer and activist Teriano Lesancha will be one of seven women celebrated at the 35th YWCA Toronto Women of Distinction awards on May 21. After learning Teriano's incredible story, it's not hard to understand why she was chosen for the Young Woman of Distinction Award. She's absolutely awe-inspiring, and I say that without even a hint of hyperbole. Born in the Maasai village of Loodariak, Kenya, Teriano Lesancha was the eldest of 15 children. At birth she was promised in marriage to the 27-year-old son of the midwife who delivered her; Teriano was supposed to marry him when she turned 12, as was the Maasai custom. Most Maasai women do not have access to education -- in fact, 99 per cent of women and girls in Loodariak are illiterate. But Teriano's mother wanted a different life for her daughter. She insisted that Teriano go to the local primary school and, with donations through World Vision paying for tuition, uniforms and books, this became possible. Teriano was soon top of her class, scoring higher marks than anyone else. She did so incredibly well that her grandmother insisted the teacher must have made a mistake when calculating the final grades. But there hadn't been a mistake -- Teriano was succeeding in school above and beyond what anyone had expected or hoped for. After primary school, Teriano was expected to leave her studies and marry the midwife's son, who was by then forty years old. But she wanted to stay in school, so her mother argued and fought with Teriano's father until he relented. With World Vision still helping fund her education, Teriano was able to go to a boarding school in a neighbouring town. There, she met girls from all over Kenya and began to think about postsecondary eduation. Although Teriano's father grudgingly allowed her to attend secondary school, he assumed that upon graduation, Teriano would return to Loodariak and get married. But once Teriano completed high school, she announced that she would instead attend college in Nairobi. There, she earned a diploma in community development before returning to work full-time in her village. In 2008, Teriano was accepted by Toronto's Ryerson University to their School of Social Work's four-year degree program. Teriano's focus during her time at Ryerson became anti-oppression framework, especially with regards to the marginalization of women. After completing her degree, she became the first person from her village to have graduated from university. Ryerson University's president, Sheldon Levy, organized a special convocation for Teriano in Loodariak. The ceremony quickly gained national media attention, and several important dignitaries, including Kenya's Minister of Education, attended. During the convocation event, Teriano's father gifted a cow to Sheldon Levy, as thanks for supporting and caring for his daughter while she earned her degree. Levy gifted the cow back to the community, asking that it be used to help support education for girls. Teriano's father and several other elders followed suit, donating a total of sixteen cows. These were used to start the Loodariak Ekiteng (Cow) Youth Education Fund, which has since awarded scholarships to over one hundred and fifty girls. Not only did Teriano's father donate several cows to the cause of girl's education, he also gave her a small plot of land in Loodariak, marking a complete turnaround of his former views on women's education and empowerment. "Maasai women don't traditionally own land," Teriano told the Toronto Star in 2013. "This is huge." Teriano's has an enormous passion and drive when it comes to ensuring access to education and economic security for the women and girls in her community. One of the first things she did after returning to Loodariak was to collaborate with local women to create the SuperMaasai Women's Beadwork Cooperative. This provided the women with a livelihood, meaning that they wouldn't be dependent on the men in their lives for financial stability. The cooperative creates and sells traditional Maasai jewellery; several of their designs are available at Toronto's Holt Renfrew flagship store. On top of all of this, Teriano also recently founded the Maasai Girls for Education Project. As part of the project she will oversee the building of residential housing for primary school girls, many of whom currently have to walk two to three hours every day to and from school, as well as offering career counselling, workshops on gender equality and other resources. Her long-term goal is to build the Maasai Girls Secondary School in Loodariak, which will be the first school of its kind in the village. Teriano is amazing not just because of what she's accomplished for herself, but also for her insistence on bringing her fellow Maasai women and girls along with her. It would be one (still very amazing) thing for her to be the first person from her village to graduate from university; the fact that she's now returning home to invest everything she's learned and gained back into her community takes it to a whole other level. She is literally changing the future of Maasai girls. This is what investing time, energy and resources in marginalized communities can do. If just one person in the community is given access to education and opportunities, she can make a difference for everyone else. One girl can change everything. See what I mean about awe-inspiring? It's no wonder Teriano is being recognized as a Woman of Distinction. It's hard to imagine that there are many women out there as distinguished as her.